A social worker who failed to pass on information about the abuse of two-year-old Sanam Navsarka a week before she was murdered has been suspended for two years. Judyth Kenworthy was a family placement officer for Kirklees Council when she was warned that Sanam, whose aunt was receiving support from the council’s children’s services, had a bump on her head and had been locked in a cupboard. But Kenworthy, who was providing support for Sanam’s family, dismissed the reports as “tittle tattle” and failed to inform the relevant social worker, the council’s duty and assessment team, or the police, a conduct committee of the General Social Care Council heard. 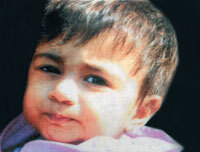 On 8 May 2008, a week after Kenworthy was told Sanam had been locked in a cupboard, the child was found dead at her home. She had suffered more than 100 injuries. Even when Kenworthy was interviewed by police officers investigating the child’s death, she did not disclose her knowledge of the full extent of the suspected abuse. Sanam’s mother, Zahbeena Navsarka, was jailed for nine years for her daughter’s manslaughter. Navsarka’s partner, Subhan Anwar, was jailed for a minimum of 23 years for murder. A serious case review published in 2009 found Sanam’s death may have been prevented if it had not been for the failure of the council’s looked-after children staff to refer concerns they had received to child protection colleagues. At a hearing yesterday, the conduct committee found Kenworthy had breached the GSCC code of practice by dismissing concerns about a child without investigation. The committee heard Kenworthy had been a social care professional for 18 years and, as such, had received training in child protection law and procedures. Yet she had made a “conscious decision” not to inform police about the cupboard, which impaired the subsequent criminal investigation into Sanam’s death. Kenworthy told the committee that she had not taken in the information about the cupboard when it was first reported on 1 May 2008. But the committee concluded she had attempted to distance herself from blame regarding her knowledge of the incident. “Even if the registrant had regarded [the concerns] about Child A as ‘tittle tattle’ and then not passing the information on was a mistake, her mistake was compounded and aggravated by not telling the police,” the committee chair said. The committee took into account Kenworthy’s previous good record, and the fact she has undertaken training since 2008 and has apologised for her failings. But the committee said it was “not convinced” Kenworthy understood the impact of her behaviour on the Navsarka family, her colleagues or on the reputation of Kirklees Council and noted that her professional failings had been “serious and multiple”. It decided that a two-year suspension was the appropriate sanction.